Entrapment neuropathy is the result of pressure on a peripheral nerve as it passes through a narrow canal that is bounded by stiff tissues. In spite of their ubiquitous nature, they are underdiagnosed, underreported, and sometimes not properly managed, especially in developing countries. Entrapment neuropathies are of various types, but the most common type is carpal tunnel syndrome. Mechanisms involved in the pathophysiology of entrapment neuropathies include mechanical compression and nerve ischemia. A clear understanding of the various types and the underlying mechanisms of entrapment neuropathies are invaluable in the decision-making process involved in the management of every patient with the condition. Keywords: Entrapment Neuropathies; Nerve Compression Syndromes; Carpal Tunnel Syndrome; Literature Review. Objectives: We sought to determine the characteristics of women eligible for a high-yield screening mammography program in Oman. 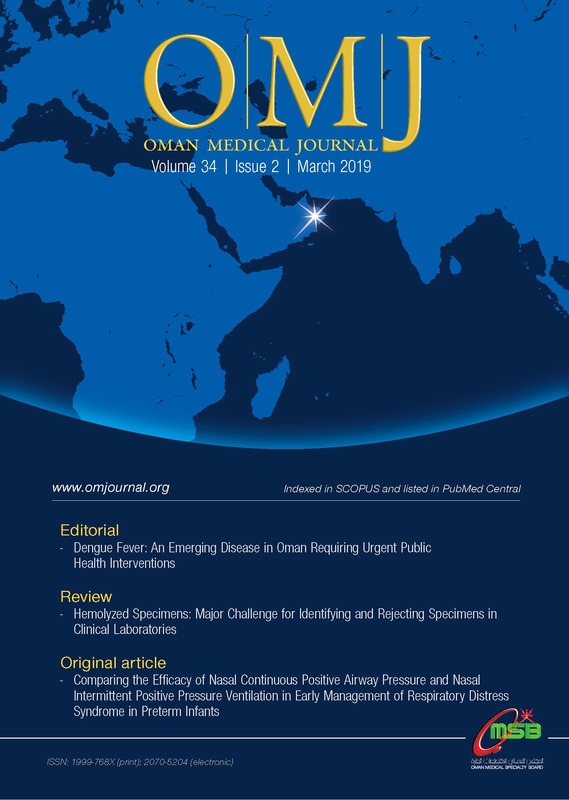 Methods: We conducted a retrospective review of women who underwent breast cancer screening at the Oman Cancer Association from 22 December 2009 to 6 February 2011. Women with a Breast Imaging Reporting and Data System (BI-RADS) score of 4–5 were compared with those with a score of 1–3 based on well-known breast cancer risk factors using the case-control approach analysis. Results: A BI-RADS score of 4–5 was found in 16.2% of women screened for breast cancer. A higher likelihood of a BI-RADS score of 4 or 5 was observed among women who did not breastfeed (odds ratio (OR) = 2.564; 95% confidence interval (CI): 1.690, 3.890), had their first pregnancy at an older age (OR = 1.062; 95% CI: 1.041, 1.083), used oral contraceptives (OR = 1.397; 95% CI: 1.008, 1.938), and those who reported a positive family history of malignancies (OR = 1.633; 95% CI: 1.285, 2.076). A BI-RADS score of 4 or 5 was significantly less likely in women with a higher number of full-term pregnancies (OR = 0.919; 95% CI: 0.890, 0.948). BI-RADS 4–5 were independently predicted in women with a lower number of full-term pregnancies, did not breastfeed, used oral contraceptives, and who had a positive family history of malignancies. These variables explained 84.0% of the variation in mammogram results. Conclusions: In the absence of a national screening program for breast cancer, the high-risk approach for screening should be considered. Women with the above characteristics should be identified and motivated to seek mammogram regularly to warrant a better outcome. Keywords: Breast Cancer; Risk Factors; Mammography; Oman. Keywords: Chronic Pain; Cross-Sectional Studies; Primary Health Care; Comorbidity; Anti-Inflammatory Agents, Non-Steroidal; Oman. Objectives: The use of growth hormone (GH) in idiopathic short stature (ISS) has been a subject of debate for the past two decades. We sought to assess the effect of GH on final height (FH) in patients with ISS in our region, which has a high consanguinity rate, and compare it to the effect observed in GH deficient (GHD) patients. Methods: We conducted a retrospective chart review from 1 January 2005 to 31 December 2013 for patients with ISS or GHD from the local United Arab Emirates population who received GH treatment and were followed-up regularly in our clinic. The change in height Z-score at 12 months and FH were assessed within each group and between the two groups. Results: Twenty-one patients with ISS and 29 patients with GHD were studied. There was a significant change in height Z-score at 12 months and FH in both groups (p < 0.001). The improvement in the ISS group was comparable to the response seen in GHD patients at 12 months (0.5±0.3 standard deviation score (SDS), and 0.5±0.4 SDS, respectively; p = 0.540). The effect on FH was better in ISS group than the GHD group of all etiologies (1.3±0.6 SDS vs. 0.9±0.7 SDS, respectively; p = 0.050), there was no difference between the ISS and the subgroup of idiopathic GHD (1.3±0.5 SDS and 1.2±0.8 SDS, respectively). Conclusions: In our local population, GH has a positive effect on the short-term growth and FH of children with ISS to the same extent that has been observed in children with idiopathic GH deficiency. Keywords: Idiopathic Short Stature; Growth Hormone; Consanguinity; Growth Hormone Deficiency. Objectives: Immunization coverage in Nigeria remains low despite the protection it confers. Reminders via mobile phones may be deployed as a means of improving vaccination coverage but requires the participation and cooperation of the caregiver. Therefore, we evaluated the acceptability of reminders for immunization appointment by mothers in Ilorin, Nigeria. Methods: This descriptive cross-sectional study recruited 526 mothers from two public hospitals in Ilorin. Semi-structured questionnaires were used to collect information on ownership and access to phones, willingness to receive reminders, household, antenatal, and delivery characteristics. Results: The majority (92.7%) of mothers had a personal phone, and all willingly provided contact details. Over half (69.0%) of mothers were willing to receive reminders. Postsecondary education (odds ratio (OR) = 1.958; 95% confidence interval (CI): 1.232–3.111) and antenatal care attendance by mothers (OR = 8.381; 95% CI: 2.495–28.170) were significant determinants of mothers willingness to receive reminders. Mothers with less than or equal to four children had a three-fold increased odds of wanting reminders. Artisan mothers were less likely to want reminders compared with unemployed mothers (OR = 0.506; 95% CI: 0.291–0.847). Conclusions: Most mothers are willing to receive reminders on immunization appointments via their mobile phone. Determinants of maternal willingness to receive reminders include mothers with less than four children, postsecondary education, and antenatal care attendance. Program planners should consider utilizing reminders as a strategy to increase the immunization uptake with access to contact details making this feasible. Keywords: Reminder Systems; Mass Immunization; Mobile Phones; Nigeria. Keywords: Innate Immunity; Inflammation; Toll-like Receptors; Neutrophils; COPD. Keywords: Seroprevalence; Toxoplasma Gondii; Risk Factors; Students, Public Health; Saudi Arabia. Keywords: Mini-Resectoscope; Hysteroscopic Adhesiolysis; Hysteroscopy; Infertile. Keywords: Clinical Trial; Diabetes Mellitus, Type 2; Patient Education; Self-Management. A ten-year-old boy presented to the hospital with body ache and joint pains for two months and headache, vomiting, and skin rash for three days. He was drowsy and lethargic at admission. Physical examination revealed bilateral papilledema. There were no cranial nerve involvement, neuromotor deficit, or signs of meningeal irritation. Computed tomography and magnetic resonance imaging of the brain did not reveal any evidence of cerebral edema or space occupying lesion. In view of the high endemicity of brucellosis in the area, Brucella agglutination test (BAT) was done at the time of admission and was negative. However, on the eighth day of admission, blood culture showed growth of Brucella melitensis. A repeat BAT at this time was strongly positive with a titer of 1:1 280. The initial one was negative due to prozone phenomenon caused by very high antibody titers. A diagnosis of neurobrucellosis with pseudotumor cerebri was made. He was treated with gentamicin, rifampicin, and septrin along with acetazolamide for raised intracranial pressure. The boy responded well to therapy and made a complete clinical recovery with resolution of papilledema. In areas endemic for brucellosis, a high index of suspicion for neurobrucellosis should be entertained in any child presenting with diverse neurological signs. Keywords: Neurobrucellosis; Pseudotumor Cerebri; Prozone Phenomenon. Separation of pubic symphysis during delivery is a rare complication resulting in considerable and prolonged morbidity for parturient women. The usual presentation is that of something giving way in the region of the symphysis pubis sometimes with an audible crack at the time of delivery. Unbearable pain on moving from side-to-side and on performing any weight-bearing activity (such as walking or climbing stairs) precludes ambulation in the immediate postpartum period. This could be accompanied by disruption of the sacroiliac joint, hemorrhage, or urine incontinence in severe cases. Radiography, ultrasound, and magnetic resonance imaging are the diagnostic modalities that aid confirmation of diagnosis. The magnitude of separation does not correlate well with the severity of symptoms. Treatment modalities range from conservative management (including analgesics, pelvic binders, transcutaneous nerve stimulation) and chiropractic management to orthopedic interventions such as external fixation or open reduction and internal fixation. Since postpartum pain is frequently dismissed as attributable to labor and childbirth, the diagnosis of pubic symphysis diastasis is often delayed and sometimes missed altogether. Since there is no consensus in the scientific literature on the definition, etiopathogenesis, and management of this rare complication, we attempted to review the literature on the subject and present a series of two cases. Keywords: Symphysis Pubis Diastasis; Radiography; Conservative Treatment; Postpartum; Pregnancy. Stridor presenting soon after birth due to bilateral abductor vocal cord paralysis (VCP) is rare. We report a family with bilateral VCP affecting four male members in two generations and hence suggesting X-linked recessive inheritance. Severe stridor in the neonatal period requires meticulous airway evaluation, and tracheostomy in 35–70% cases. The current trend is towards conservative management and tracheostomy is avoided unless respiratory distress is severe or life-threatening. Neonatal VCP can be an isolated finding, or it can be familial with or without syndromic features. There are very few reports of non-syndromic familial cases. Unlike the cases reported previously, none of our patients required prolonged intubation or tracheostomy suggesting an excellent prognosis in such cases. This is the first case study of congenital familial non-syndromic VCP reported from the Middle East. Keywords: Congenital Vocal Cord Palsy; Oman; Stridor, Congenital Abnormalities; Tracheostomy. Subcutaneous fat necrosis of the newborn (SCFNN) is a rare benign inflammatory disorder of the adipose tissue but may be complicated by hypercalcemia or less frequently, hypocalcemia, resulting in morbidity and mortality. Here we report the case of a neonate with subcutaneous fat necrosis who surprisingly developed hypocalcemia instead of hypercalcemia. A full-term female neonate was delivered by emergency cesarean section for fetal distress and was subsequently admitted to the Special Care Baby Unit. The mother’s pregnancy was uncomplicated up to delivery. Her anthropometric measurements were birth weight 4.1 kg (95th percentile), length 50 cm (50th percentile), and head circumference 34.5 cm (50th percentile). The Apgar scores were 2, 3, and 8 at 1, 5, 10 minutes, respectively. There was no abnormal facies and she was fed with breast milk only. On the seventh day of life, the infant was found to have multiple nodules located in the neck, upper back, and right arm. The nodules were firm, well circumscribed with no evidence of tenderness. Her total serum calcium level was 1.55 mmol/L (normal range 2.2 to 2.7 mmol/L) and this was associated with hypotonia and poor sucking reflex. The packed cell volume was 40%. The serum albumin and blood glucose levels were normal. Her blood culture was sterile. A clinical diagnosis of hypocalcemia associated with SCFNN was made. The infant was treated for hypocalcemia (using calcium gluconate) and was carefully followed-up. The skin lesions resolved completely three months after their eruption. Repeat serum calcium measurements at three, six, and nine months of age were all within normal limits. Although SCFNN is a rare benign clinical condition, it may be complicated by hypocalcemia. Therefore, periodic measurements of the serum calcium levels is warranted in such a patient, beginning from the neonatal period up to the age of six months. Keywords: Hypocalcemia; Infant, Newborn; Subcutaneous Fat Necrosis; Perinatal Stress. Keywords: Portal Vein; Liver Cirrhosis; Portal Hypertension.